Got a scoop? Send it in: here! Isla Fisher 'forgets her trousers' for mag photoshoot! @ New Kerala: here. Trailer Report @ Calsun.com: here. First Look: My name is Isla, and I'm a shopaholic @ USA Today: here. Sacha Baron Cohen hijacks Milan Agatha Ruiz de la Prada fashion show @ Times Online: here. Isla Fisher does beach cartwheels @ News.com: here. Isla Fisher wedding on hold @ Mail Online: here. Today's HD Hottie: Isla Fisher @ TV Predictions.com: here. Actress ISLA FISHER's ex-fiance DARREN DAY has been charged with driving under he influence. @ Contact Music: here. Horton Hears a Who @ Creative Loafing: here. Star power dims lights at Bal Harbour @ Miami Herald: here. The star wattage at Bal Harbour Shops blew the circuits -- literally -- Sunday as half of the shopping magnet went dark during the filming of Confessions of a Shopaholic at Prada. Gucci, Valentino, Chloe, David Yurman and Ferragamo were among shops affected. As customers were escorted from the boutiques by security, they caught a glimpse of the movie's star, Isla Fisher. No sightings, however, of Fisher's hubby Sacha Baron Cohen, though the blackout definitely had Borat written all over it. First Look: Shopaholic Kiss @ TheBadandUgly.com: here. Worth Seeing @ SFGate.com: here. Now Playing: Definitely Maybe @ Daily Vidette: here. Red heads best in bed? @ AskMen.com: here. Hollywood hears Isla Fisher @ News.com: here. Backflip as Isla shops for a new role @ Daily Telegraph: here. 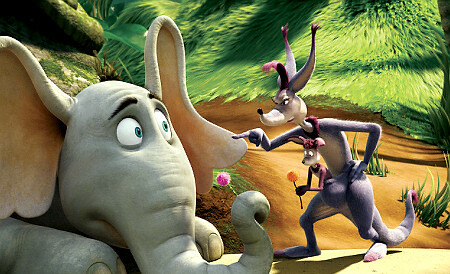 'Horton Hears a Who' is a real hoot @ NY Daily News: here. This site is an UNOFFICIAL FAN SITE. It has no affiliation with Isla Fisher.